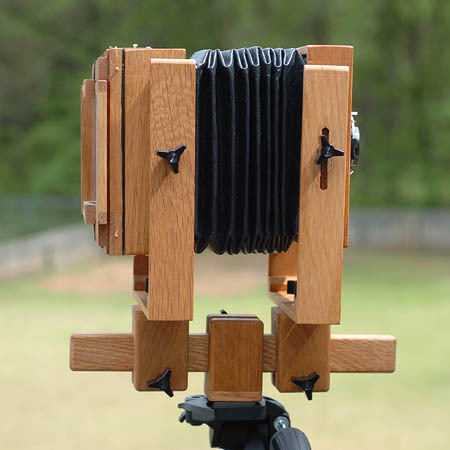 This camera is based on Jon Grepstad's 4x5 design. I began building this camera in 2005 and decided to finish it after seeing Bob Fallis' excellent camera over in the Alt Forum. 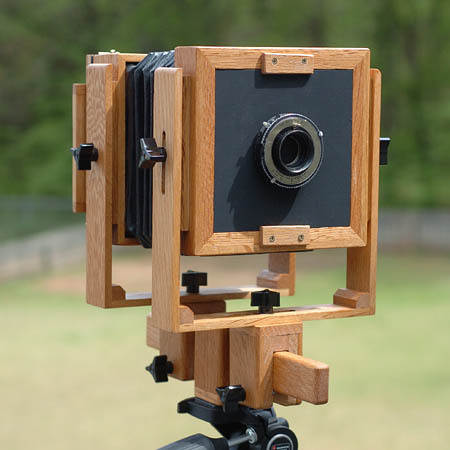 This is an oak 4x5 view camera that was built for use with a lens. I don't currently have a suitable lens so I made a pinhole for it. It is a 200mm f400 with a rotating spring back. The oak is recycled from an old desk. The bellows is a piece of vinyl from the fabric store with stiffeners cut from cereal box material and lined with black lightweight cloth. I used information from Doug Bardell's web site and a few others to make the bellows. Pieces of truck tire inner tube provide the tension for the "spring" back. The focusing screen was cut from a back salvaged off an old Premo 5x7. The pinhole is installed behind the iris of the shutter which is from a Kodak folder. Using a piece of oak for the focussing rail was a mistake. It reacts to changes in humidity and will make friction focussing difficult. I'll replace it with a piece of square aluminum stock eventually. Also, if I ever fold another bellows I will look for thinner material. 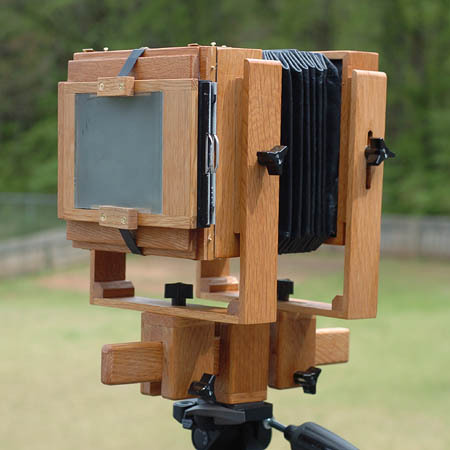 I don't think I'll use this camera much for pinhole photography - I have other 4x5 pinhole cameras that are much easier to use in the field. I do, however, like the long focal length and narrow field of view. Super Ralph, it's a beauty. Nice work, as usual, Ralph. Nice work, Ralph! 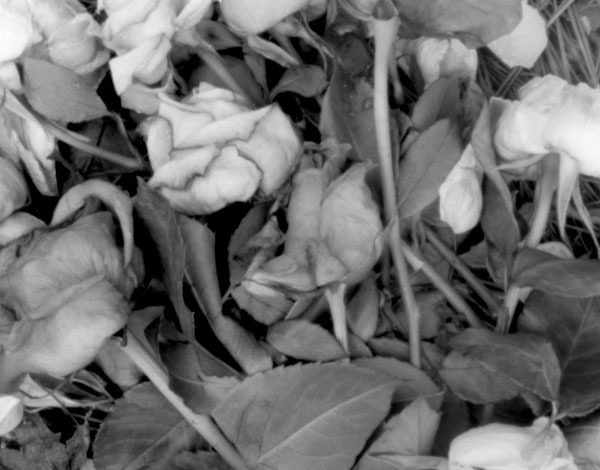 While I'm sure it will work well with glass, the results are pretty sweet with pinhole too. Drop dead gorgeous camera! The envy will not run deeper...very nice photo as well.